Milwaukee County is running their annual fund raising drive for United Way. Among the various ways that they are trying to raise money, there is an online silent auction. Among the items being bid upon are things like tickets to the zoo or Mitchell Domes and other nice things. 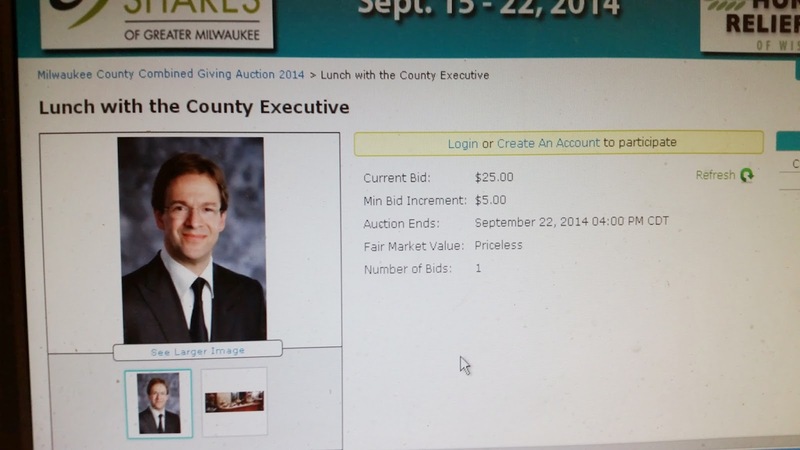 Only one bid...I wonder if it was Abele or one of Abele's minions he ordered to put in the bid? Deann Alexander, maybe? I'd put in a bid, but he'd probably just raise the bid himself at the last minute. At least a charity would benefit. I'd put in a bid, but I'm afraid I would win. There's no way I could put up with his bleating that long.